Amazing location near Hyde park and in short walking distance to Museum Station. Bed was reasonably comfortable, shower pressure was good. The park view was excellent, as was the location. The bedding felt luxurious. Hotel is in a great location! A beautiful walk down the street and through the park and you’re in the city. The room was nice and clean. Location of property was very good, on the Southeast corner of Hyde Park, very close to bus and subway stops. Room size was awesome; two seperate bedroms, large kitchen and living room area. This was a suite with a well-equipped kitchen. toaster and an oven and dishes! It was spacious and had a great view. I was able to prepare my own breakfast and lunch. Close to Museum station, and an easy walk to many places. Location was great. Easy to get around. Plenty of restaurants handy. Rooms were clean and tidy. Room was clean & good size, location was reasonably good. 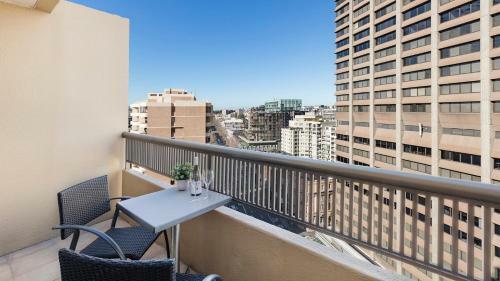 Oaks Hyde Park Plaza This rating is a reflection of how the property compares to the industry standard when it comes to price, facilities and services available. It's based on a self-evaluation by the property. Use this rating to help choose your stay! Overlooking the famous Hyde Park, Oaks Plaza offers self-contained accommodations with TVs and DVD players. The hotel features a sauna and rooftop deck with stunning views across Hyde Park. Guests receive 30-minutes free Wi-Fi per day, per room. 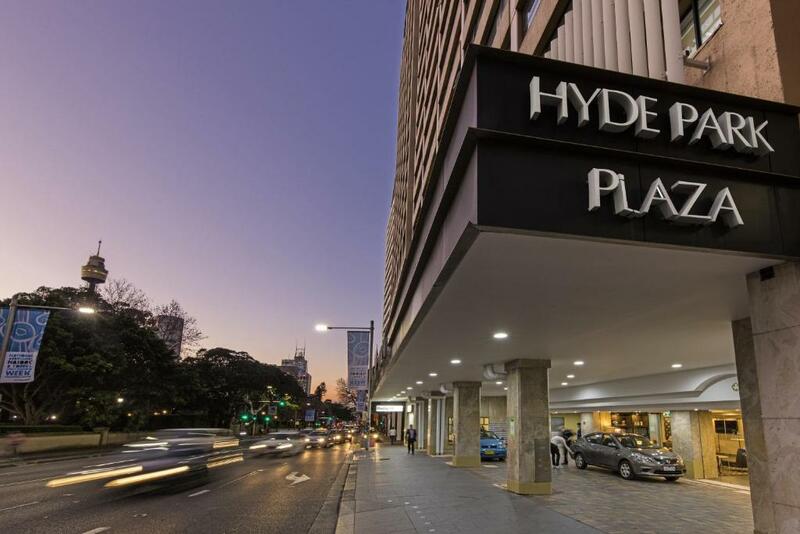 Oaks Hyde Park Plaza is located in Sydney CBD (Central Business District) on the corner of Oxford Street. Sydney Opera House and Darling Harbor are each a 15-minute drive away. 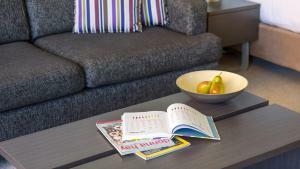 All rooms are air conditioned, and include a well-equipped kitchenette or kitchen with a dishwasher and microwave. Most rooms have a private balcony with beautiful city views. Guests can work out in the well-equipped fitness center. 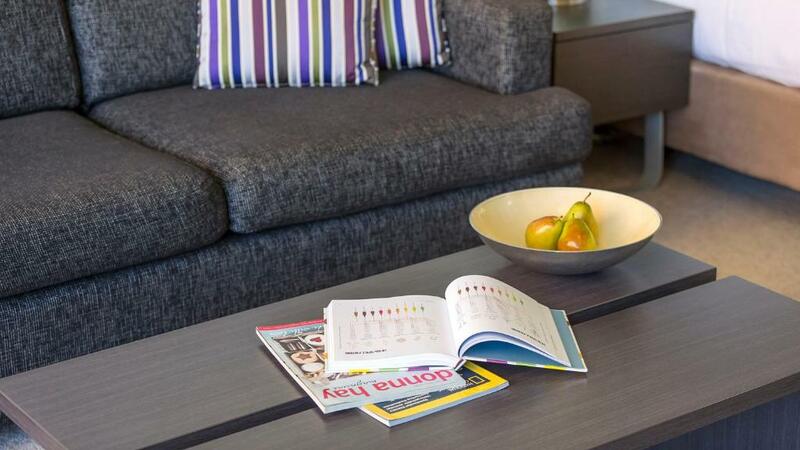 The tour desk can recommend local attractions and help guests with travel arrangements. 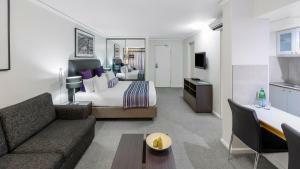 When would you like to stay at Oaks Hyde Park Plaza? This spacious and refurbished apartment features a fully equipped kitchen, a separate seating area and work desk. This spacious apartment features a full kitchen, a separate sitting area and work desk. This modern, partially refurbished open-plan studio features a large LCD TV, a kitchenette with a microwave, tea/coffee making facilities, a sofa and a dining table with chairs. This modern and refurbished open-plan studio features a large LCD TV, a kitchenette with a microwave, tea/coffee-making facilities, a sofa and a dining table with chairs. This recently refurbished, modern apartment has a full kitchen, air conditioning and a DVD player. This recently refurbished, modern apartment has a full kitchen, a DVD player, a microwave and air conditioning. 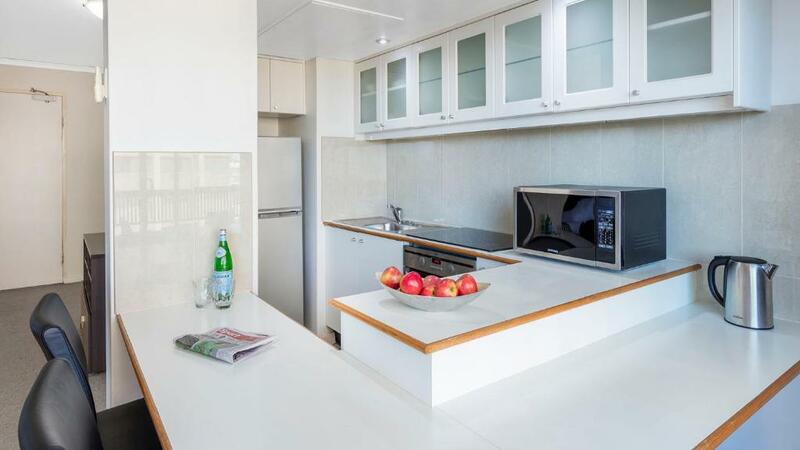 This apartment features a electric kettle, cable TV and kitchenette. This apartment has a toaster, oven and flat-screen TV. This apartment has a dining area, toaster and tile/marble floor. 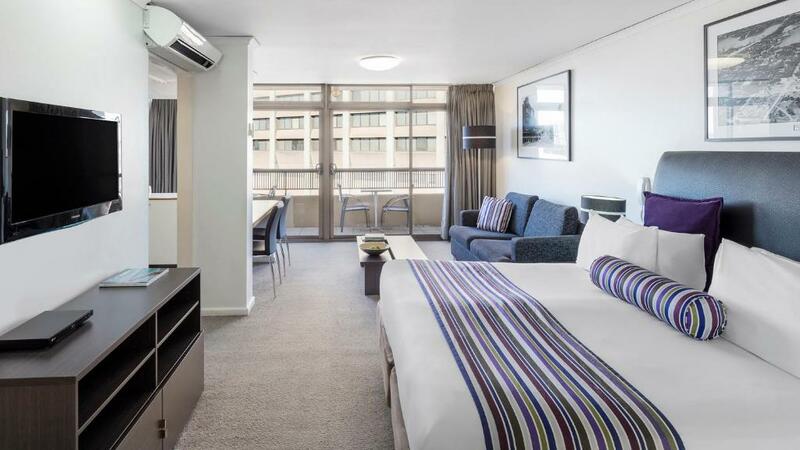 Set on the fringes of Hyde Park, one of Australia’s most renowned and oldest public parkland, Oaks Hyde Park Plaza is the must-stay accommodation choice when visiting Sydney. Offering a fresh and tranquil change of pace for travellers to the city, our hotel overlooks Hyde Park’s green open space – ideal for a leisurely stroll, early morning run or afternoon picnic – and is opposite the Anzac War Memorial and Pool of Reflections. House Rules Oaks Hyde Park Plaza takes special requests – add in the next step! Oaks Hyde Park Plaza accepts these cards and reserves the right to temporarily hold an amount prior to arrival. Parking was a nightmare. Very limited spots and such tight space - it was almost impossible to move around. Recommend you request a car park before arrival. Good location, park just across the road so our child could run around. Also an iga grocery store very close by. The room only had one bathroom which was very small and the bath was not very clean. I think it was more to do with the age of the bath. The shower was in the bath which was a concern for my elderly mother who is 85 yrs. to get in and out of. The parking area was small and very tight. The location was good. The living room and kitchen area was comfortable with plenty of space. The staff were friendly and helpful. It was very noisy. And was very run down. There was mould on the roof as your walked in the door way unfortunately. The bed was comfy and it was prime positioning for all tourist attractions. We were a little surprised with the state of the bathroom ... although clean it is clearly very much in need of maintenance and upgrading ... also some of the amenities were lacking here on the first day. The location, staff ,the fact we had a huge balcony. Twin bed could have been bigger, leaky shower or sink.. floor was always wet after use. Friendly staff, loved the terrace. 1) references to a dishwasher - there wasn't one. 2) Lack of sponge to clean dishes or a way to dry them. 3) Fan in bathroom is constantly on. was annoying at night. The bathroom is tiny compared to the kitchen, living room and bedroom. The living area is extremely spacious. There is a fully equipped kitchen and washing machine. There is a TV in the lounge and bedroom. Very modern and comfortable furnishings and decor. Bathroom exhaust was terrible. Every thing was wet. The beds we had should have been on castors, as they rolled around when getting in or out off, as well as when we wanted to just sit up in bed and read/watch tv. Location of property.When booking I asked for a quiet room if possible, this request was meet. The rooftop pool, which was a great area to relax after a busy day. Did't have restaurant meals in house. Just used the apartment facilities. The bathroom was small and needed update. View was fantastic. Supermarket around corner. Great. Close to train station and buses. Transport excellent. Close to galleries and museums.